Peter Jennings’ post ‘America: big fires grow from small ones ’ has sparked debate (here  and here ) but appears to have gone unremarked by readers of The Strategist, despite touching on numerous issues. Peter’s not a great supporter of President Obama’s latest remarks  on national security, which he sees as placing too high a threshold on America’s intention to use military power. Consequently, Peter fears that most of the international order (and particularly America’s ‘frenemies’) will assume there’s little prospect of the US actually using military force, the more so because there has been no US combat response to the capture of Mosul by the jihadist group ISIS and its subsequent advances in Iraq. Yet in America’s use of hard power since the mid-20th century, and in the outcomes of that use, the semantics of declaratory policy seem to have been of less import than the interaction of historical circumstances. As Peter notes, the understated declaratory policy enunciated by US Secretary of State, Dean Acheson, in 1950, might have contributed to the outbreak of the Korean War. But the movement of North Korean troops across the 38th parallel produced exactly the American military reaction that should’ve been expected from such blatant aggression (and from such an affront to a newly-established international order, even if the involvement of the UN was fortuitous). Similarly, whatever the statements of resolve along the way, there was little relevant to declaratory policy in the outcome of America’s military actions in Vietnam and Iraq in 2003. 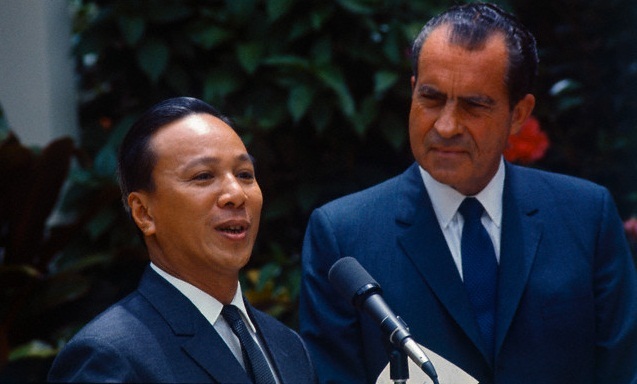 The Vietnam War unrolled via policy drift into ever-deepening involvement. The Iraq War was more a climax to intense debate after an unpredicted event changed the Bush Junior administration’s early flirtation with a less-than-assertive security stance. In between, Bush Senior’s successful intervention against Iraq’s invasion of Kuwait might have reflected central norms of US declaratory policy on national independence and the stability of the world order, but Saddam Hussein’s aggression ensured a rare unanimity of international resolve. Still, to extend Peter’s metaphor, those operations weren’t great advertisements for the fire brigade. The Korean and first Gulf Wars extinguished the flames as required. But the Korean peninsula remained in a state of military standoff (the only theatre where US forces continued to be garrisoned), with the Democratic People’s Republic able to raise the level of military threat and sustain a state of strategic risk. The Vietnam involvement has a claim to leaving the least problematic outcome because the US and its allies lost so comprehensively. Especially after the issue of Cambodia was settled, Vietnam’s primacy in Indochina allowed the normalisation of relationships in Southeast Asia and now the irony of Vietnam’s neighbours supporting its cause in the dispute with China over seabed mineral exploration. In contrast, in Iraq the fire brigade drove in, burnt the place to a shell and left the locals bickering about how to put it all together again. In summary, America’s deployment of military force since 1950 left Presidents Eisenhower, Nixon and Obama scrambling to adopt exit strategies for engagements that didn’t achieve the objectives of military deployment and left unresolved the problems that justified the intervention in the first place. The problems weren’t resolvable by military action and, being so, exhausted the patience of the American electorate. Military intervention was clearly unavoidable in Korea, arguably mistaken in Iraq in 2003, but only in the first Gulf War, where the trigger was military and the objectives military, was it a solution to the problem. Meanwhile, declaratory policy did dominate in one key area. The Cold War of the nuclear superpowers wasn’t merely critical to national interests but threatening to national survival. The declaratory policy that emerged aimed to manage the existential threat in a way that convinced both the US and Soviet leaderships that they could maintain control in an environment of mutually assured destruction. The only deviation was when the USSR decided to deploy nuclear weapons to Cuba. The resultant crisis ensured the rules weren’t stretched again. Yet, even here options for force deployment remained important. Both sides were anxious to advertise their resolve, not by refining policy statements but through demonstrating new nuclear weapons technologies, including MIRV warheads, mobile launching systems or highly-accurate miniaturised tactical warheads, which emphasised the continuing viability of their arsenals. So, to the focus of Peter’s concern—should the Obama administration’s declaratory policy specify the bad guys and the deeds that won’t be tolerated? Should it foreshadow tank tracks on the ground? And if it did either or both, who would listen? Since Peter wrote his blog post, ISIS has renamed itself the Islamic State, proclaimed the return of the Islamic Caliphate and claimed the loyalty and obedience of all true Muslims. Those aren’t the actions of people who listen to anyone. Yet I suspect ISIS has overreached in its attempt to seize the authority of Sunni Islam’s power base. It’s now a threat to both the ruling elites in Saudi Arabia and the Gulf States (who’ve heretofore funded the jihadists) and to their powerful wahhabist and salafist clerics. As for the tank tracks, the Middle East has already exhausted the two-and-a-bit presidential terms that the American electorate will tolerate. It will likely be some time before an American president again deploys a large military force there. That’s not to say there’ll be no US military action. Abu Bakr al-Baghdadi, ISIS’s leader, might well disappear in one of those drone-delivered explosions that have so much become a part of America’s use of armed force, as to prompt their own area of policy debate . Part of the Acheson speech that Peter quotes declares ‘the initial reliance [against aggression] must be on the people attacked to resist it’. Two decades later the Nixon Doctrine said much the same. It might not be a bad idea to apply again. I suspect the Iraqi people will resist the jihadists, not in a way approved by the international community but by asserting their sectarian and tribal identities, the very things the US military deployment in Iraq never successfully addressed. The Israeli government appears to be  already placing an each-way bet on that—but that’s a subject for another post. Derek Woolner is a visiting fellow at the Strategic and Defence Studies Centre at the ANU. Image courtesy of Flickr user tommy japan .